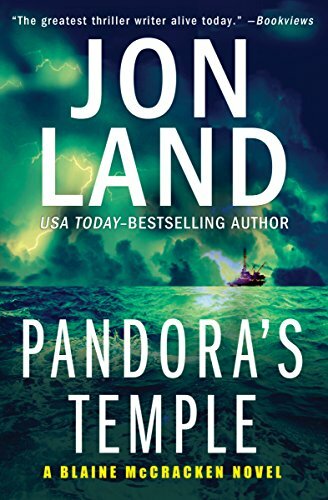 Jon Land’s latest fast-moving thriller, Pandora’s Temple, wastes very little time with irrelevant preamble, literally throwing the reader into the very heart of a storm—practically without a life jacket. “‘It would help, sir, if I knew what we were looking for,’ Captain John J. Hightower of the Aurora said to the stranger he’d picked up on the island of Crete. Hightower pursed his lips, frustration getting the better of him. Without warning, the ship is violently hit, tossed about like a toy boat in a bathtub. Reports start coming in of a suboceanic earthquake recorded in numerous seismic centers around the world. Possible devastating tsunami coming in and around the area where the Aurora is searching for this mysterious weapon. Suddenly the bank of the Aurora’s computer screens, depicting the seafloor in a quarter-mile radius directly beneath them, spring to life. There’s something forming in the seabed right before their very eyes. Some sort of eerie structure. Something so massive in scale its breathtaking as well as terrifying. What exactly is the mysterious structure? And why is it so dangerously important that the bad guys don’t get their hands on it first? Joining forces again with his trusty sidekick Johnny Wareagle, Blaine McCracken races to stop both an all-powerful energy magnate and the leader of a Japanese doomsday cult from finding the dark matter they seek for entirely different, yet equally dangerous, reasons. Ultimately that race will take him not only across the world, but also across time and history to the birth of an ancient legend that may not have been a legend at all. The truth lies 4,000 years in the past and the construction of the greatest structure known to man at the time: Pandora’s Temple, an enclosure built to safeguard the most powerful weapon man would ever know. After a 15-year hiatus, Jon Land’s take-no-nonsense hero, Blaine McCracken, is back. While Mr. Land has been busy on other books, such as the critically acclaimed Caitlin Strong series, there has always been a call from fans of the McCracken series to see their champion brought back to the action. They got their wish in this bold, bigger-than-life adventure called Pandora’s Temple. Mr. Land has been called “The greatest thriller writer alive today.” After reading this latest installment in the Blaine McCracken series – think Indiana Jones meets Jason Bourne it’s easy to concur. Superbly created multidimensional characters mixing with thrills and spills of a world on the brink, and a modern-day larger-than-life hero to cheer for, Pandora’s Temple is a tour de force of adventuretelling power from a master storyteller.